Wow how windy was that ? New to paddle boarding,have a heap of questions. Maybe you have been paddle boarding and are looking at a new board. Not sure what to get. Well we can help. Just flick through your query and we will endevor to answer and help you with your question. 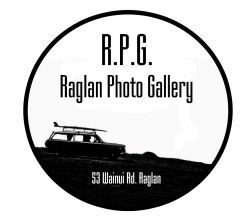 Situated on the beautiful Whaingaroa Harbor an enviable location, that provides consistent conditions for surf and flat water instruction. Allowing our school to cater for beginners in a safe environment, through to paddlers who want to go to another level level and get out in the waves. There is access to the world famous left hand points breaks and the consistent West Coast beaches along with calm inner harbour conditions. The main thrust of the school will be towards Stand Up paddling, with group, and one on one lessons available along with board hire age. 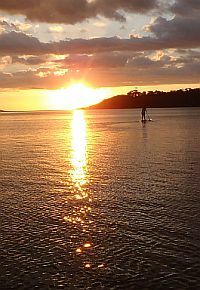 We have spent the last few years promoting the sport of Stand Up paddling and have become well known in the region as the people to come to, to find out anything to do with stand Up paddling. 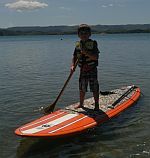 We have been busy at the International Surfing Association, paddle board instructor school and have obtained the highest qualifications available in NZ for paddle boarding approved by Surfing NZ. We also updated our First Aid and Life Saver certificates while the water was a bit cooler. All aimed at you guys getting a great safe experience. from 10 yrs to 80 yrs and older . 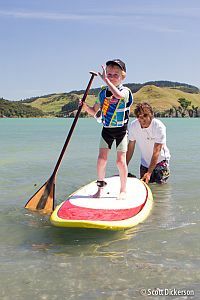 The paddle board shed has a range of Paddle boards to choose from as little as $20 for half an hour. Longer times available on request. Thanks for the fantastic afternoon yesterday. Hinekaye and I really enjoyed our time on the water. She is still buzzing about standing on the board. All the other kids are jealous they missed out on a great afternoon. ” Michelle. to giving it another go. ©2010 www.thepaddleboardshed.co.nz uses the "Notepad Chaos v2" theme.